He debuts at the U.N. this week to a skeptical audience. President Trump is attending the opening of the annual U.N. General Assembly in New York City this week for the first time.1 On Monday, he’ll host an event to discuss reforms to the organization, and on Tuesday he’ll make his first formal address to the body. The world isn’t just watching; this time they’re Trump’s target audience. So what does the world think of Trump? What about the actual content of what Trump will say at the U.N.? Beyond U.N. reforms, other major issues on the international agenda are North Korea, Syria, terrorism and climate change. In its 2017 survey, Pew asked respondents whether they approve or disapprove of five of Trump’s specific policies, some of which track with U.N. priorities. CORRECTION (Sept. 19, 4:55 p.m.): A previous version of the third chart in this article, showing the net approval rating of President Trump’s proposed policies, mislabeled Israel, Germany and Russia. The chart has been updated. We’re not exactly talking about the “world’s” opinion, of course. Every year Pew surveys populations in five to 40 countries. It’s not clear how Pew decides which nations to poll, so it’s not clear how representative of the entire planet the countries are. 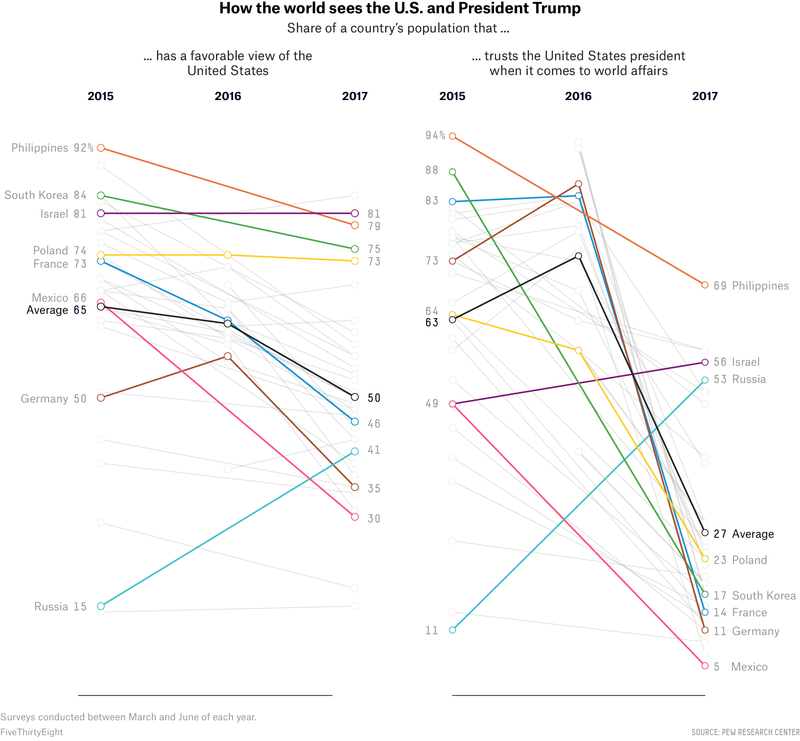 That said, this survey represents the best recent effort to systematically measure foreign public opinion of the U.S., as they ask the same key questions each year and there is some continuity between countries from year to year, especially in more recent years. Pew asked these two questions in 37 countries in 2017, 17 countries in 2016, and 31 in 2015. For a full list, see their methodologies each year. 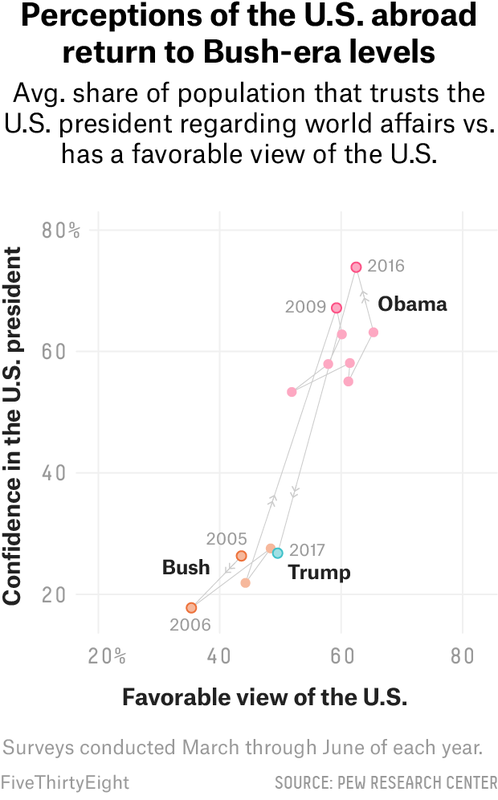 If you really want to get into it, the percent favorability of the U.S. since 2005 had a mean of 53.9 and standard deviation of 9.1, while the percent of respondents who had confidence in the U.S. president had a mean of 47.1 and a standard deviation of 19.8. The 2017 survey was conducted before the latest round of tensions with Moscow — Russian President Vladimir Putin himself isn’t attending the General Assembly this year — so a survey of Russians today might get a different result. Chinese President Xi Jinping isn’t attending this year, either. Unfortunately, Pew didn’t survey China in 2017. While the Pew survey technically goes back to 2000, it only included a few countries in the early years, and didn’t always ask these two questions, so we only went back to 2005 for Bush. The countries in the Bush and Trump samples are similar but not identical, largely because the Trump sample is much larger. 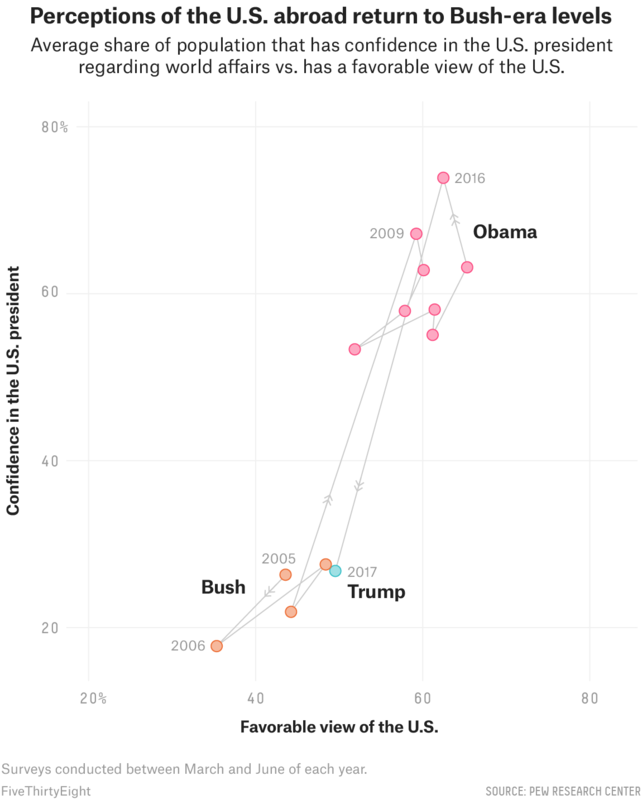 Trump’s approval is lower when we consider only countries — most of which are those same collective defense agreement countries — that were in the Bush-era surveys. Several countries in the sample had high proportions of respondents indicating “Don’t know/Refused to answer.” Countries that had a 20 percent or higher proportion of respondents in this category across most questions include India, Poland, Russia, Indonesia, Tunisia and Turkey. For these countries, low awareness could affect their approval rates.